PA Server Monitor has a couple of different ways of monitoring and alerting on temperatures which will be discussed below. 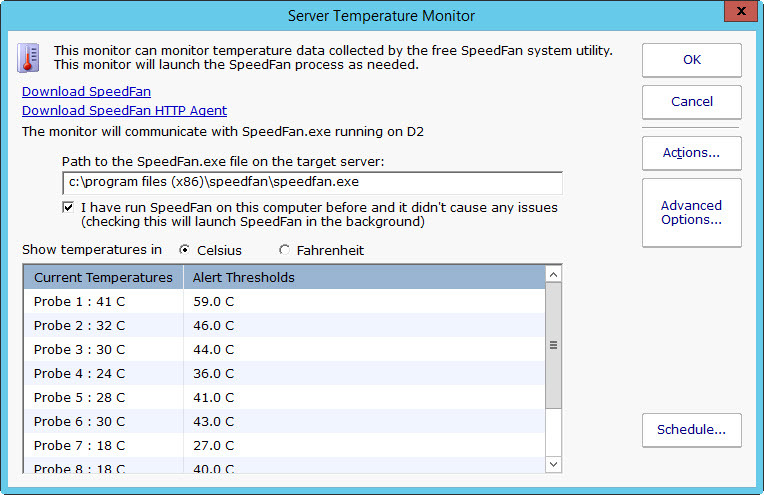 To monitor these values on Windows computers, you can use the free SpeedFan utility. SpeedFan can measure temperatures from all of the probes installed in a computer. PA Server Monitor's Server Temperature Monitor will monitor those probe values, alert if needed, and even chart them. You can monitor SpeedFan installed on many computers across your network with our free SpeedFan HTTP Agent. The Server Temperature monitor will connect and retrieve temperature data across the network, the same as it retrieves data from a locally installed SpeedFan application. 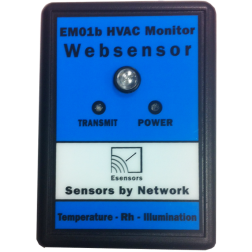 The Environment Monitor can connect to an ESensor EM01B device and monitor its output. These devices are popular in server rooms, and can be placed anywhere on the network. There are many other devices that expose their temperatures via SNMP. Temperatures from all of those devices can be monitored via the SNMP Monitor. This monitor is configured for a Room Alert 11E. See the full list of actions here. PA Server Monitor can do so much more. Take a look!